Walk, run or roll with us at the 4th Annual Shamrock Shuffle on Saturday, March 4, 2017 at Holy Infant Catholic Church in Ballwin!! You can participate in the 1-mile fun run/walk (furry friends & strollers welcome) OR bring your race-day competitive spirit to the 5K (race against others or beat your own personal best!). Awards presented for male & females within each age category for 1st-3rd place. All registrants earn a finisher’s medal, a performance shirt & a swag bag of sponsorship goodies! 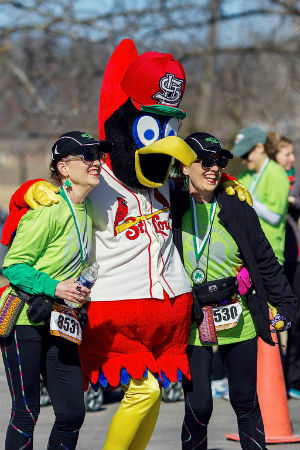 Again this year, the after-party will feature AWARDS, KID’s ACTIVITIES, FREDBIRD®, FOOD TRUCKS, MUSIC, DANCING, sponsor-provided beverages and KSDK’s Dana Dean as our emcee!! Come see for yourself why this event has grown exponentially year after every year! All proceeds benefit Holy Infant’s Outreach Programs and 10% to Officer Flamion. Long sleeve performance shirts. Women's sizes: XS-3XL, mens sizes: S-3XL, youth sizes: XS-XL. Shirts guaranteed to those who register by 2/20.